The Snuz mattress is determined to get you better sleep. This is done by focusing on the 7 zones of your body for optimal ergonomic support and pressure relief. 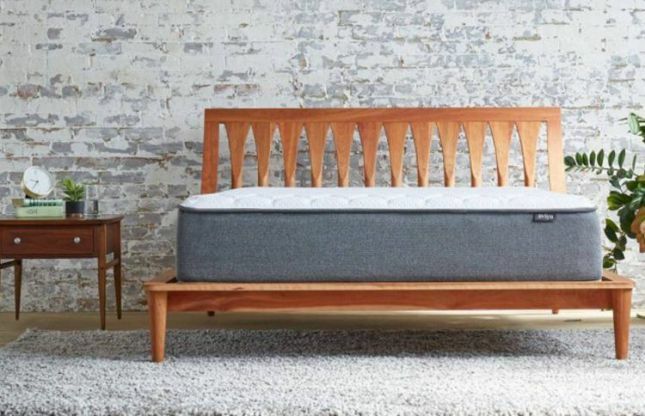 This mattress is a 10″ thick three-layer mattress. It combines a layer of zoned polymer and a layer of charcoal infused memory foam. The comfort foams sit on a dense base foam. This creates a solid, durable foam bed that will lead to a great night sleep. It is also covered in a zippered cover that is designed with added cooling materials as well as anti-dust mite properties. Check out our quick video review of this versatile online mattress. The top polymer layer of the Snuz bed is specifically zoned into 7 sections. This creates custom areas that support and contour the body. It allows for ideal pressure relief in every sleeping position. Especially for side sleepers who need their shoulders and hips to sink in. This helps you sleep sounder by reducing tossing and turning and results in a more restorative sleep. Under this top layer of polymer is the memory foam layer that adds to the comfort. The memory foam is infused with charcoal to help wick away moisture as well reduces odor for a cleaner, cooler mattress. This carefully crafted mattress also comes in at a great price point. It is made in the USA and conveniently packed and shipped right to your door. The Snuz also comes with a 100 night sleep trial period as well as a 10 year warranty. The Snuz mattress could be your answer to a snooze filled night, especially if you want a responsive yet pressure relieving layer that hits all the right spots, literally. Learn more about the Snuz mattress and shop at snuz.com. Below we have our in-depth Snuz mattress review. Including our comprehensive video review as well as our detailed written review. We will go through how it performs for off gassing, comfort, motion transfer, sleeping cool, edge support, value, material, trial and warranty. Keep reading our in-depth review of the Snuz mattress below. The very first thing to do with your new Snuz mattress is take it out of the box and get it set up. It should show up right at your door and in a fairly compact box, for a mattress anyway. Getting it to where it needs to go may take two sets of hands. It is about 75 lbs and a little awkward to maneuver if you’re on your own. Once you get it to where you’ll be sleeping it should only take a few minutes to get it out of the box and take it out of the plastic and come to life. During the unboxing process, you will notice very minimal off gassing. With most boxed mattresses there will be a little bit of smell once it is allowed to unroll and take shape, but this one is made in the US which helps tremendously with cutting down on any noxious odors. It should be fine within a few hours but if you are more sensitive to certain smells letting it breath up to 12 hours would probably be a good idea. See how easy the Snuz is to unbox and set up in the video below! When setting up your new mattress it will need a foundation that provides a flat, even surface that will support the weight of the mattress as well as the sleepers. It also will need to be the right height for you as well as be aesthetically appealing. Snuz also sells box springs and adjustable bases. Otherwise, the Snuz mattress would work great on any box spring with or without a frame, an adjustable base, a platform bed or slatted bed. The comfort of the Snuz mattress should be ideal for every sleeping position, especially back and side sleepers. This universal feel mattress only has one option for comfort but should appeal to a very broad spectrum of sleepers. The focus of the Snuz bed is its unique 7 zoned polymer top layer. This layer is perfect for ideal pressure relief in all the right spots as well as makes for less tossing and turning and more restorative, sound sleep. This mattress is also hugging yet responsive to make for just enough contour without feeling stuck. The comfort of this mattress should fall around a 5.5 to 7 on a firmness scale of 1-10. 1 being the softest and 10 being the firmest. The support of the base foams and density of the memory foam should provide good ergonomic spinal alignment and core stability. The memory foam will also help with deep comfort as well as even weight distribution. The overall comfort of the Snuz bed should really appeal to the side and back sleepers who would benefit from zoned pressure relief and support. This mattress is an all foam mattress and like any all foam mattress it should have minimal motion transfer. However, the top layer of this mattress is polymer which is more responsive and may produce more vibrations. However it is sitting on top of a layer of memory foam which will help soften any motion. This mattress should have very minimal movement felt. The Snuz bed mattress would be good for anyone who shares a bed because of this, there will be little disturbance when getting in and out of bed. The Snuz bed is an all foam mattress that may hold some heat. However, there are several properties in the design to help reduce heat retention. The top layer of polymer is zoned with three sections that have grooved polymer instead of solid polymer. This not only helps with pressure relief but also adds aeration to the foam for heat dissipation. The second layer of memory foam is also infused with charcoal. This is a great property that helps wick away moisture and will help keep the bed clean and odor free of any perspiration. 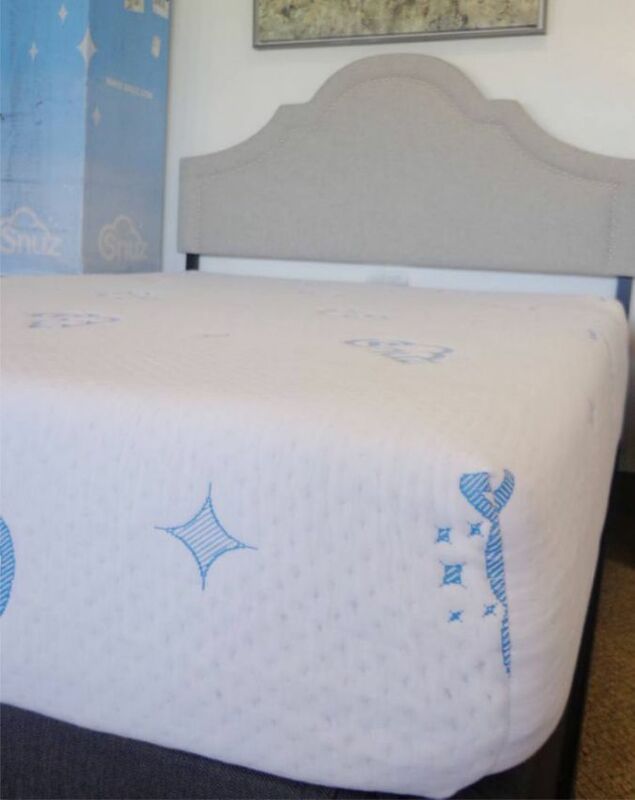 Lastly, the cover on the Snuz mattress has added cooling properties to stay cool to the touch as well as breathable. The edge support on the Snuz mattress should feel fairly stable and create an edge to edge usable sleep surface. The base foam should provide the necessary support to give the entire mattress a solid foundation, including the edges as well. Sleeping on this mattress you should feel a consistent feel across the entire top of the bed. As far as sitting on the edge goes, there is going to be a little less support, because there isn’t any foam encasement. So sitting on the edge may be less ideal and not feel very solid. Our Sleep Guide has the latest pricing as well as any and all available coupons or discounts for the mattresses we review. We have a direct relationship with Snuz and make sure that we pass along the most up to date savings and discounts to our readers. The Snuz mattress is a 10″ thick, three layer all foam mattress. The top layer is a unique 7 zoned 2″ thick High Density Polymer Foam layer. This layer makes this mattress is ideal for pressure relief and creating the perfect amount of sink and contour for each zone of your body. It also has aerated channels that help air to flow and heat to dissipate allowing for a cooler sleeping surface. The middle layer is 2″ of Charcoal Infused Memory Foam. This foam layer is great for added comfort and pressure relief as well as adaptable support. The charcoal also helps in wicking away and absorbing moisture to help keep the mattress cleaner and odor free. The bottom layer of the Snuz is 6″ of Dense Base Foam. This is the foundation of the bed and is where the core support and durability are. All of this is covered in a zippered cover that custom made with cooling as well as anti-dust mite properties to keep your mattress that much cleaner and cooler. The Snuz mattress has a 100 night sleep trial period. This trial period allows for a sufficient amount of time to see if this mattress is a good fit for you and also has an easy return process if it isn’t. If you are looking for more specifics for the Snuz trial period find out more at snuz.com or for a helpful tool check out Our Mattress Warranty & Trial Period Guide. The Snuz mattress has a 10 year warranty that shows that this company backs their product. The 10 year warranty is a fairly standard warranty for the mattress industry. This provides consumers with the confidence that this is a mattress that the company will stand behind. If you are looking for more specifics for the Snuz warranty find out more at snuz.com or for a helpful tool check out Our Mattress Warranty & Trial Period Guide. You like a mattress that is zoned for ideal pressure relief and comfort. You like the responsive, yet contouring feel that the polymer and memory foam combo provides. You want an all foam mattress that has minimal motion transfer and a great price point. Still looking for some more information? Visit Snuz at snuz.com. Also, have questions for us? Please contact us and we would be happy to help you!